We tend to think of pharmaceuticals as chemical matter caught up in complicated legal and economic relationships, but it is probably more useful to think of them as legal artifacts oriented towards a potential (but by no means guaranteed) biochemical fulfillment. Up until they enter our bodies, when they are being discovered and developed, patented, registered, packaged, sold and bought, pharmaceuticals trade in promises of therapeutic and financial value that are sustained, first and foremost, by legal means. “Legal” doesn’t mean here clearly and conclusively defined, but rather the opposite: a form of ambiguity that sustains a practice of continuous speculation. While they circulate in networks of exchange, pharmaceuticals are best understood as legal fictions. As Lon Fuller put it: lies that are not meant to deceive (Fuller 1930). 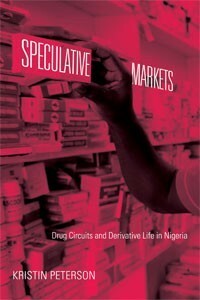 In her book Speculative Markets (previously reviewed by Emilie Cloatre), an ethnographic investigation of pharmaceutical trading in Nigeria, Kristin Peterson introduces us into a world where lies proliferate but deception seems to be in short supply. This is a world where vast quantities of drugs of dubious provenance and questionable efficacy change hands in places that are ostensibly not markets, at prices that shift quickly and wildly and for no obvious reason. Yet this is also a world where everybody seems alert to the mismatch between appearance and reality, and stands ready to capitalize on this discrepancy to eke out a meager living. Everybody, that is, except the final user of the drug, the patient in need of medical treatment who, arriving at the end of a long chain of transactions, must consume a product that is for all intents and purposes indecipherable and likely to be inefficacious at best.